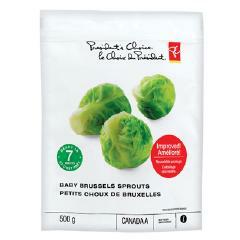 Usually I only buy fresh Brussels Sprouts, however needing a quick side to an evening meal I tossed these into the grocery cart (along with the PC small sweet peas and a bag or two of Asian vegetables), threw them in a pot when I got home and voila they were done, lovely and delicious. Because of their delicate size they cook up in a snap – after trying these, they’re a new favourite. 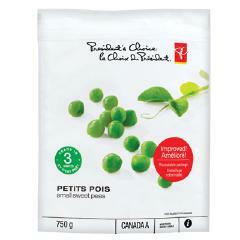 I was pleasantly surprised by these Presidents Choice PC Small Sweet Peas.